Can I mix and match visit lengths? Yes, feel free to customize your schedule. Cats and dogs love a surprise longer visit! Good question- and of course, it depends. The prices for our pet sitting visits are below. To get an exact quote for what your pet needs, please give us a call. Our blog, How Much Does a Pet Sitter Cost, covers in detail the cost and the value of various types of pet sitting services. If you are still determining the length and number of visits per day to book, please refer to this article for dogs and this article for cats. What length of visits should I book? 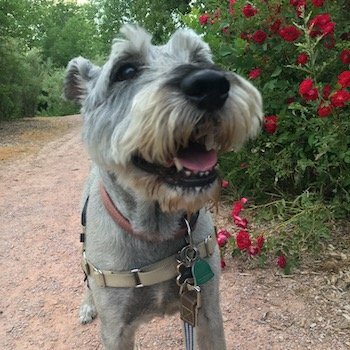 For Dogs: What Length Pet Sitting Visits Should I Book For My Dog? 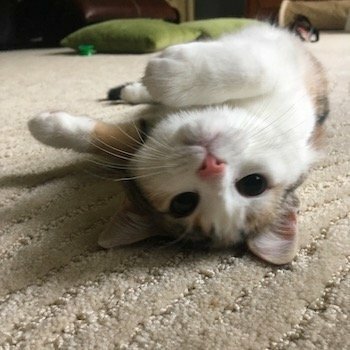 For Cats: What Length Pet Sitting Visits Should I Book For My Cat? Can you give my cat insulin? Yes, we certainly can. Please let us know the time window we must meet for your cat’s shot. Friends, neighbors, cleaners, etc. will be at my house while I’m away. Should I let you know? Please let us know if someone will be in your home during our scheduled visits. It makes our heart skip a beat if we meet a stranger in your home! We don’t mind if someone will be at your home outside of our scheduled visits. However, it does make sitters nervous to find items moved around in your house, therefore we will contact you if we don’t know the cause. How far in advance should I book my pet sitter? During our busy season for pet sitting, (spring, summer, fall, and the winter holidays), it is best to schedule visits 1-2 weeks in advance. For Christmas specifically, it is best to schedule 3-5 weeks in advance. Aside from the Christmas holiday, we can usually get clients in with 4-5 days’ notice. It is sometimes possible to schedule with 1-2days’ notice, but not guaranteed. 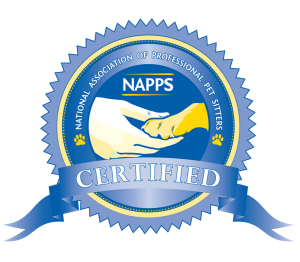 We can book pet sitting visits up to 1 year out. If you are a weekly dog walking client, we are much more flexible. See our Dog Walker FAQ page for more information. What times during the day can my pet sitter come? Please check out this article about time-slots for more information. Do you offer service pet sitting over the holidays? Yes, we offer service on all holidays. Please note, major holidays such as the 4th of July, Thanksgiving, and Christmas book quickly. It is best to schedule your holiday visits a few weeks in advance. Can you bring in packages, mail, and the newspaper? Yes, we bring in all packages, mail, and newspapers. If you have a food delivery, let us know and we will put it in your refrigerator. Can you water the garden or indoor plants? Yes, we provide both house plant and garden watering. If your garden is large, please book an appropriate length visit on the days we will be watering so you sitter has adequate time to do a good job. What if my trip runs long or my flight is delayed? We always keep a few open slots in our schedule in the situation that your trip runs long or you would just like to add an extra day to your vacation. Please keep in contact with us and we will make sure your pets are covered. There are no last-minute booking fees if you extend your trip. Can you take out the gargabe bins on trash day? Yes, this is one of the many house sitting services we offer. Should I pet proof my home? We recommend cleaning your home before you leave- cleaning kitchen sinks, taking out the trash, and picking up the floors, etc. We also recommend putting all medications, food, and toys in their normal location. If you keep pet items in a pantry, drawer, or closet, you can label the location with a post-it note if you like. Can you pet sit for dog reactive dogs? Yes, we care for dog-reactive dogs all the time. We are happy to help. My dog is a destructive chewer, should I do any extra pet proofing? Book one or two mid-day visits. Close doors to rooms your pets do not need access to, especially bathroom doors. Leave all medications in their normal location or put them somewhere that your dog cannot access. Section off a hard floored room or area of your house as a doggy playroom. Start feeding meals in Kong toys as shown in this video. Do not give your dog rope toys. Consider working with our Animal Behavior Consultant to start working on good chewing habits. For more information about destructive chewing, see Ian Dunbar’s article and this video. Can you care for people aggressive dogs? Pet Sitting is our focus, but we do so much more. The value in hiring a professional agency is broad. If you have ever hired a pet sitter, only to wonder if they are showing up on time (or at all) you know what I mean. There are a lot of great pet sitters out there. But, I do not know of any other company that focuses on improving the way we offer service as much as we do. Along with taking care of your pets, we consider it our job to figure out ways we can do an even better job of taking care of your pets. And since we have had this same focus for years, our service is pretty awesome. We fill out a care sheet at each visit. We do this to make sure we cover every detail at every visit. We also leave it out for you when you get back home so you can see what we did during your visits. 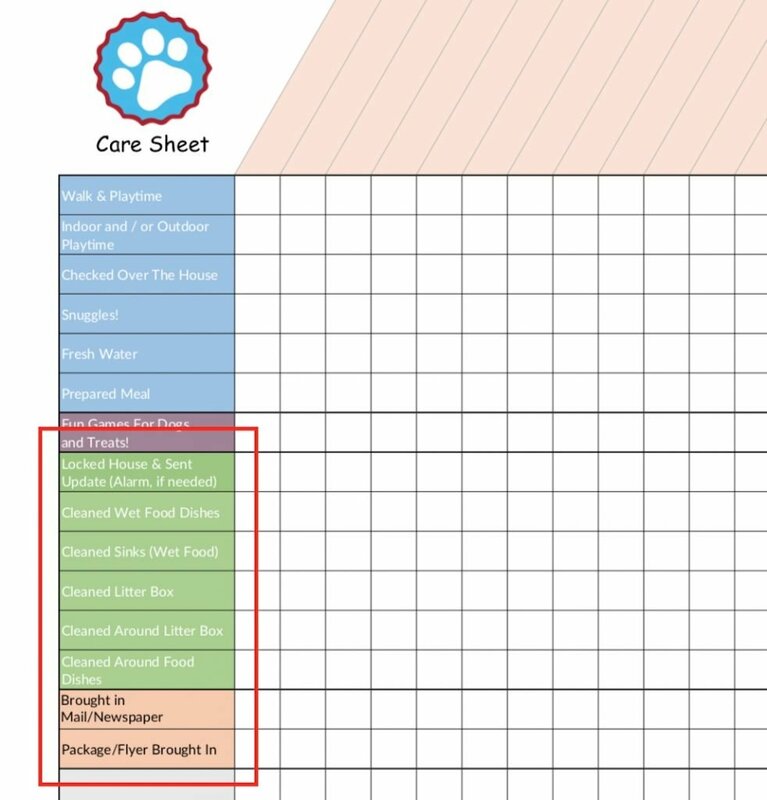 The care sheet covers pet care, house sitting, reward based games that we can play with dogs, and a section that we can customize for any special care or items. The green section is all about checking over your house, keeping things clean and tidy, and taking care of daily chores around the house.